One local firefighter has received a prestigious award. 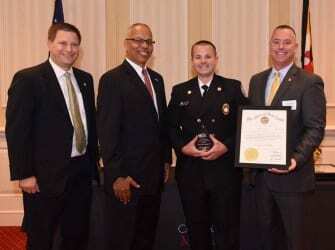 Captain Rick Blubaugh of the White Marsh Volunteer Fire Company received a volunteer service award from Governor Larry Hogan and the Maryland Governor’s Office on Service & Volunteerism this week. Capt. Blubaugh was one of 16 award recipients who received recognition on Thursday, October 20, at an event hosted by Lt. Governor Boyd Rutherford. The award recognizes Capt. Blubaugh’s commitment and dedication to the White Marsh Volunteer Fire Company. A total of 418 nominees were submitted from across the state of Maryland. WMVFC officials told NottinghamMD.com that Capt. Blubaugh received his award for his time and dedication to the company as the Vice President of Operations since 2010 when there was constant leadership turnover, poor morale, and internal issues. Capt. Blubaugh was motivated to resolve the problems within the organization so that it could provide a better service to the community. Last year, Capt. Blubaugh served over 1,300 hours of volunteer time responding to over 220 calls.